The trolleys will be back to transport patrons to six of the City's most interesting homes during the celebrated Annual Avondale Estates Tour of Homes! 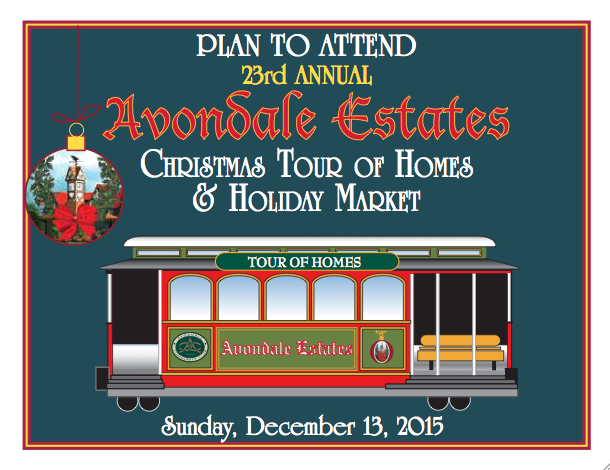 Plus, enjoy the Holiday Market at the Avondale Community Club from noon to 6 p.m. and "Christmas in Avondale: A Festival of Nine Lessons and Carols" at the Avondale Estates First Baptist Church at 6:30 p.m. The church will provide parking for trolley riders. Tour the town, then enjoy the music of the season! Afternoon: 3 p.m.; 3:15 p.m.; 3:30 p.m.
Evening: 5:30 p.m.; 5:45 p.m.; 6 p.m. This year's featured homes include a Stan Pike renovation, a bungalow, a 1960s ranch, two Lockman Homebuilding Co. homes and more! Tour homes are located on Dartmouth Avenue, Lakeshore and Wiltshire Drive. The Holiday Market features an Authors' Corner, great gifts, delicious foods and fun finds at over 30 booths. Advanced tickets are available at City Hall, Finders Keepers Furnishings, REAL Salon and Seventeen Steps for $15. Day of tickets can be purchased for $20 at the Avondale Community Club. For more information, visit the Tour of Homes website and Facebook page. ⇐Previous 2016 Community Promotion ProgramNext⇒ The Month of Merry in Avondale Estates is here!